I used to read a lot about floral waters in cosmetics, in particular rosewater and lavender water. 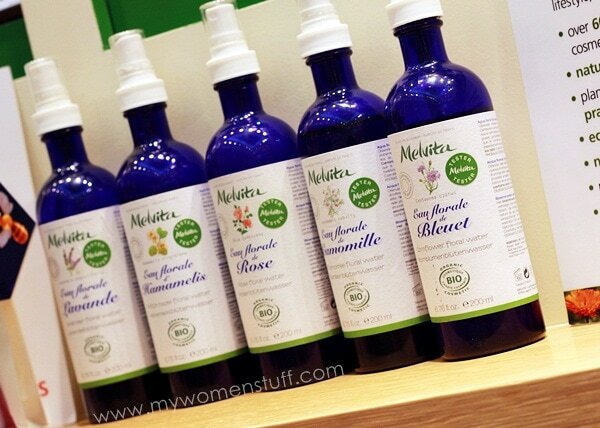 It has been used in cosmetics for a very long time to freshen and soothe the skin and is quite possibly the origins of what we now know as toner 🙂 I’d never really tried them until I came across the ones from the French organic brand Melvita. Can I just say up front that I absolutely love the impractical heavy deep blue glass bottle packaging? I love it! Its heavy and if you are the klutzy sort, you could quite easily let it slip through your fingers and have it smash on the floor. But I love it nonetheless because it lends an old world charm to my skincare routine. 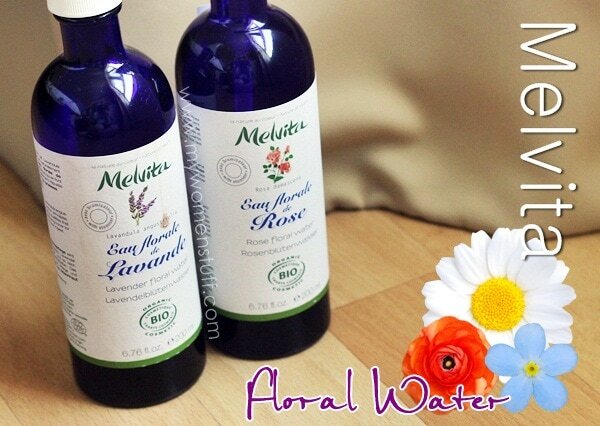 The floral waters are, I’m told, obtained from the distillation of the flowers but I believe the Melvita Floral Waters are mixed a little because the ingredient list do mention some other ingredients, perhaps to boost their efficacy. So how would you use these floral waters then? I use them primarily as a refreshing spritz after cleansing my face, and also as a toning water as it offers some hydration properties. The scent of lavender and rose is quite strong in both these waters, and the Lavender Floral Water is supposed to help calm the skin. It most certainly evokes feelings of calm because the scent is quite strong. The Rose Floral Water smells of fresh roses and is supposed to be good for sensitive skin. Other than the skin refreshing effects of these sprays, I will tell you quite honestly that I don’t know what other benefits it delivers to my skin because I have not noticed anything marked, other than the nice fresh feel and a lovely smell. It doesn’t feel sticky on, which has to be a plus right? If you use a toner or lotion then you may think this is just another waste of time and you could very well be right. But I do like them, and so I use them daily. Floral waters distilled from flowers that refresh and tone the skin. The bottles are heavy glass which I know many are not in favour of but which I happen to like. The product sprays out in a fine mist on the skin and cools and refreshes the skin leaving a nice smell of flowers. I like using this to dampen the skin after cleansing because damp skin absorbs serums and creams better. I don’t see any other benefits to my skin otherwise. Disclosure: Lavender Floral Water was a press sample. For posting guidelines please read my disclaimer. Hi Paris, a nice & honest review as always. =) I have yet to try floral waters & this one looks interesting, being organic & all. Btw, I noticed from your photo that the expiry date for the lavender one is February 2012? I prefer to have my skincare in the glass bottle too. This facial mist sounds very interesting, PB. Is the mist quite hydrating too? Or it’s mainly for freshen up? High 5 for glass bottles 😀 As for the hydrating properties, I find the rose one a little bit more hydrating on the skin than the lavender. I use it in place of toner/lotion most of the time. Spritz it on and while damp, apply my serums or creams and it absorbs better 🙂 I don’t leave it on or use it on its own though. eh? why the rose is a bit more exp than the others? approximately how long can they be kept ah? Rose essential oil usually costs more hence the price difference. I think the expiry date on the bottles are about 6 months but the lavender one that’s practically expired still smells ok when I use it. I wouldn’t stock up on this because its organic and natural and all that. But I must admit, I am quite a fan of nice scent, and I like using rosewater as toner/pre-toner. Spritzing works best if you are out and about. When I travel and plod around cities on hot hot days its very refreshing (and helps me take those last steps to walk back to wherever I’m supposed to go) But on normal days, its a bit of a bother unless you have very dry skin or the air-conditioning is drying your skin out 🙂 Maybe if you use a floral water, it’ll encourage you to spritz more often LOL! Hmm, isn’t this similar to face mist? I love Melvita, especially their oils 😀 Never really tried these, though, and now I’m intrigued haha! But eeeks, Rose for sensitive skin? Not a fan of most rose-scented stuff though, so maybe I’ll check it out at Melvita first before buying 😛 They’ll certainly make a refreshing spritz on a hot day or when on a flight (If they ever come up with a smaller sized one) and I think I will use it as a “setting spray” after makeup hmm. The idea of spraying flower-infused water on the face sounds lovely! Glass bottle is a yay for me, means less pollution. Only if they reuse the bottles – it would be nice if Melvita had some form of recycling programme so we can return the bottles and containers to them. At least we’ll know they’re doing something about it else if we just toss it out with the trash, we won’t know either if they actually recycle them locally. Totally randomly: the first thing I noticed about these is the fact that the instructions are in Dutch! I can only see part of the back of the bottle, but usually if the instructions are in French and Dutch the products are marketed in Belgium *happy dance* The site gives some addresses of where I can find Melvita here, so I’m definitely going to take a look! Thanks for making me discover a brand that’s actually so close to me, Paris! Oh hahaha yup, we eat pretty well here in Belgium 🙂 You can actually find recipes for Flemish stew online. I’ve made it on my own and it’s pretty yum! Hey Paris, I found it in French, but I can translate it for you if you want! Let me know! Thanks for the offer Sunny! I’ll look up the recipe and if I don’t find a good one in English, I’ll take you up on your offer! I’ve replaced my Vichy sprays too! Just in time since we can’t get them here anymore LOL It would be nice to be able travel with these though. I have tried a couple of Extraordinary Waters but haven’t quite gotten my head around the concept 😛 How do you use yours? Haha! I did a last minute shop around just before Vichy pulled out of pharmacies here and managed to bag myself 2 gigantic cans of those Vichy sprays at Buy One Get One Free! =D I foresee them lasting me a while so I am going to refrain from buying those gorgeously scented floral waters! 😉 As for Extraordinary Waters, I usually place about 3-4 drops onto my palm and then pat it all over my face – Hada Labo lotion style! How do you usually use yours? ROSE FOR ME ROSE FOR ME!!! I’m using the orange blossom one. i use it as mask and it really really does brighten up my skin! lovely product! Happy to know you like this Natalie! I haven’t noticed brightening properties, but its nice and relaxing as a mask isn’t it? I am an absolute fan of rose products. I’ve been using rose water every night after cleansing for quite a while now. I even talked about it in my blog!